After driving back to Ringwood yesterday, I find myself back in Bristol today. Some might think that it would have been better to spend the weekend in Poole, but I am finding that Bristol is becoming more and more like home, so here I am. Having had only a two day working week, life has been pretty hectic, and unfortunately, schedules have not been met, but having to take two days unpaid leave rather scuppered any timescales that might have been set. Still, I’m up here with Bumble once again, and the weekend holds hopes of many pleasant things. There is a plan to visit Bristol Zoo tomorrow, which will be brilliant if Sam can take us on a backstage tour. Sadly, I won’t be able to see either of my daughters today, both of which are celebrating their wedding anniversaries. But I can at least send my congratulations and hope that they both have a wonderful evening and weekend. Is It Mursday Or Is It Thonday? The first day back after a rather strange few days away from the office, I couldn’t decide whether it felt like a Monday or a Thursday, or maybe somewhere between the two. The drive down to Ringwood this morning was easy, but slow. Lots of time to chant and to take stock of the things that had happened recently. The office was rather quiet, though it was good to have Lawrence back after his holiday and even better to fix a few of the issues that were outstanding. I was also pleased that I was back in the office to say farewell to Elaine, who left today to rest and prepare for the birth of her second baby. It always surprises me how life just trundles on when you aren’t looking. The Wheel of Life turns eternally, there is no beginning or end, just the repetition of different phases that we all pass through. All that is asked of us, is to make the most of each and every second and to learn the lessons that life presents to us. Today was Auntie Pat’s funeral at Westerleigh Crematorium. The family gathered in the pleasant, if a little damp surroundings, to say a fond farewell. Not being of any particular religious persuasion, her service was quite a happy affair. After singing the hymn All Things Bright And Beautiful, we listened to her son Paul read an uplifting eulogy and then we all joined in for a rendition of Always Look On The Bright Side Of Life, certainly a first for me at any funeral. Although the reason for the gathering was very sad, the nature of the service, and the gathering at The Folly Inn afterwards, could not have been described as sombre. Just, as everyone commented, how Auntie Pat would have wanted it to be. Being up in Bristol a lot of the time now, gives me the chance to spend much more time with my grandsons, which is brilliant. This evening we went over to see Hannah and then on to see Charlotte, as it was my last chance to see either of them before their 5th and 10th wedding anniversaries respectively, this Friday. Although I had seen Stanley, Jake and Zach fairly recently, they are all young enough to change almost day by day, so it was brilliant to catch up with their development. Stanley, currently an only child to Hannah and Jay, has always been a little character, with his own mind and attitude. But he’s been going to pre-school for a while now and it was quite noticeable that his social skills are improving in leaps and bounds. He was much more outgoing than he was even a couple of weeks ago, and had Bumble and me playing hide and seek all round the house. He’s also just had a new Spiderman bicycle, which he was proud to show off, riding around the lounge and kitchen diner. He a lovely little chap, and is all the more fun now he is talking with, and relating to other people so much more. Round at Charlotte’s, Oliver, our one year old grandson, had already gone off to bed, but Jake and Zach were in fine form. 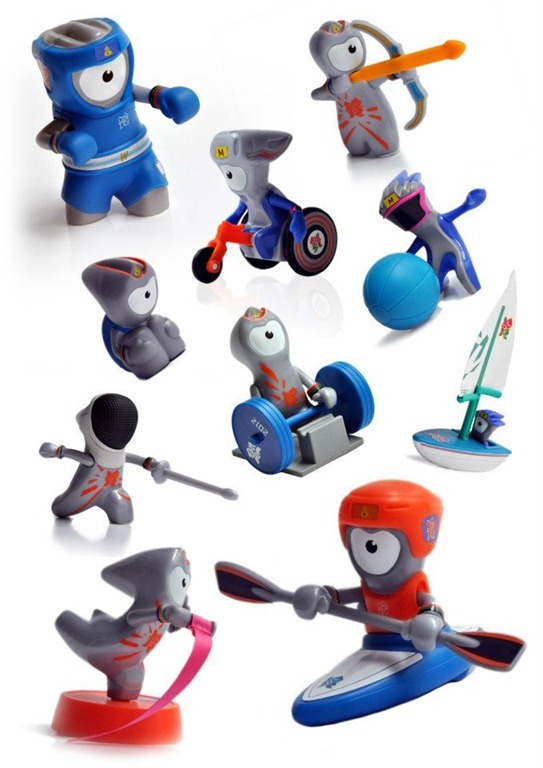 Jake showed us his collection of McDonald’s Olympic Toys, one of which was a wheelchair athlete, which is great to see. Zach had a dinosaur toy with an opening mouth, which was good fun. Sadly, the evening ended with Zach and I having a tearful, on his part, stand-off. He had given me his dinosaur whilst he played with Jake, but when he came over to take it back I asked him to say ‘please’. He refused, whereupon I refused to give him the toy. I cuddled him, whilst stopping him from taking the dinosaur, and asked him in a quiet voice, simply to say ‘please’ and that I would then let him have it. In the end, the dinosaur was put onto a shelf, Zach went off to bed in tears and I felt terrible. Whilst I believe that manners and etiquette are important, I would never have put the two of us in the situation, had I know the outcome. Children must be taught the rights and wrongs of life, but I will be interested to see Zach’s attitude to his grumpy grandfather when I see him next. They do say that there is no such thing as bad weather, just a bad choice of clothing. But I do think it is a bit sad, that on the last public holiday before Christmas, the heavens decide to open in such a biblical fashion. After yesterday’s ‘Hedge-gate’ incident, the weather made any further progress impossible. Records show that today was the second wettest day of a very, very wet August, and I can believe that. The rain actually woke us this morning. So an enforced rest day, not that resting is in Bumble’s vocabulary, so she had to do some ironing. I finished reading ‘The End Of The Affair” by Graham Greene, a rather sad, if thought provoking book, recommended by my friend Jason Michael of Homophilosophicus. We also managed to fit in a bit of educational telly, Horizon on mapping the universe, a very interesting subject. Whilst I talk about us all being part of the universe, it is difficult to get a mental grip on the astronomical (literally) distances involved. Without meaning to overstate the obvious, the universe is a really, really big place. However, it does have an end, or rather a spherical outer limit, so what is on the other side of that limit. Well the answer, as far as we know today, is a whole set of other universes. If you ever wanted a good example to show you just how insignificant, in astronomical terms, the Earth really is, I think we have found one here. The privet hedge down the left hand side of the cottage garden is becoming a bit of a monster. The garden side was getting far too high to be trimmed without the aid of a safety net and the lane side is more in the domain of steeple jacks. It had been decided that we would use the hedge trimmer to give it a good haircut and Bumble had already started the job earlier in the week. It had, however, also been decided that we would give ourselves a rest this weekend and do fun things rather than just chores. So I set to with the trimmer and had finished the job B had started in about an hour. Feeling pretty satisfied with my efforts I was rather dismayed (huge understatement) when I found Bumble talking to Roy, one of the neighbours, about how the hedge had been managed in the past, and how it would be much easier if we were to lop a couple of feet off the top. I was pretty miffed and made no secret about it. B went into one of her ‘leave it and I’ll do it myself’ moods, which just made me more annoyed. So having delivered a wise instruction to ‘not speak to me’ I got well and truly stuck in with the tree loppers. I wouldn’t recommend using anger as a way to boost your life-energy, it’s pretty volatile stuff. But by the time we had decimated twenty or so feet of the top of the hedge my mood was much improved and we hadn’t killed each other. What started off as a one man hedge-mashing exercise turned into a two man (well one woman and one man) project. I burned off all my angst and Bumble forgave me for being less than sociable for the initial half an hour. Speaking about it later, we decided that the whole incident could have been avoided with a little better communication and we have promised to try to achieve that in the future. Neither the course of true love, nor the path to enlightenment are without their challenges, but having overcome the problem, we are better for the experience, and we have a much more manageable hedge. Ever since Bumble and I have been going out, there has been this third party in the equation. Let’s be frank, his name was, and still is, Chris. Not that I am particularly prone to jealousy, but there was always something a bit ‘secret’ about his presence. He is in a new relationship, and has been pretty much ever since they split up, but his new significant other is rather possessive and will not allow B and Chris to meet. Presumably because she is worried that he, or she, or they, might decide that they had made a mistake. Bumble is allowed to pop round to collect her misdirected post, but only if Chris, and particularly his new lady are out. B has always been very open about all this, she can be painfully honest at times, but when the odd chance to meet Chris had occurred, I was left sitting in the car, and the mystery continued. So imagine my surprise when, whilst pottering around the garden today, Chris turned up on his new Triumph motorbike, to deliver a rather important looking misdirected letter for Bumble. I guess that he might have expected us to be out, but finding us home, came in anyway. But what of this mythical being? Well, pretty much as expected really, he is a really nice bloke. Bumble obviously has really good taste in men, the children’s father, Nigel, is a really nice bloke too. I have no idea what they think about me, but we seem to get on pretty well. We sat and had a drink in the garden, had a nice chat about what was going on with him and with us. He said how sorry he was to hear about Ivor and hoped that all had gone well with the funeral. All very civilised. So the mystery, if ever there was one, is now solved, and life goes on as usual. I guess, looking back, the real mystery is why I thought there was a mystery at all. Watching the tail end of tonight’s Crimewatch, in which Kirsty Young talked to the mother of the murdered James Bulger, as well as interviews with some of the survivors of the massacre on the eve of the sentencing of Norwegian mass-murderer Anders Breivik, it was heartening to see that people can pick up the pieces of their shattered lives and move on. Forgiveness is a powerful emotion. It allows us to take a look at events in a different light and move into a future without bitterness. James Bulger’s mother has accepted that although she can never get her son back, she can honour his short life by giving children of today some happiness through a charity which allows them to take holidays they may otherwise never have. The people who perpetrate such horrendous crimes are ill. No sane person would entertain the thought of doing such things, so they also deserve our compassion. Living with the results of their actions must be a huge burden and we should all spare a moment’s thought for that. Life is far too short to carry the emotions of revenge and hate around with us. Forgiveness frees us from those emotions and although it might seem weak to forgive, it does, in fact show a huge amount of inner strength.